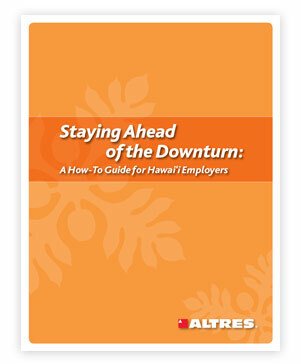 “Staying Ahead of the Downturn: A How-To Guide for Hawaii Employers” delivers straightforward tactics for dealing with a down economy. This second in a series of white papers, from Hawaii’s most trusted source of HR expertise, offers practical steps that can strengthen the foundation (and brighten the future) of any organization. Fill out the form to gain immediate access to our Staying Ahead of the Downturn.